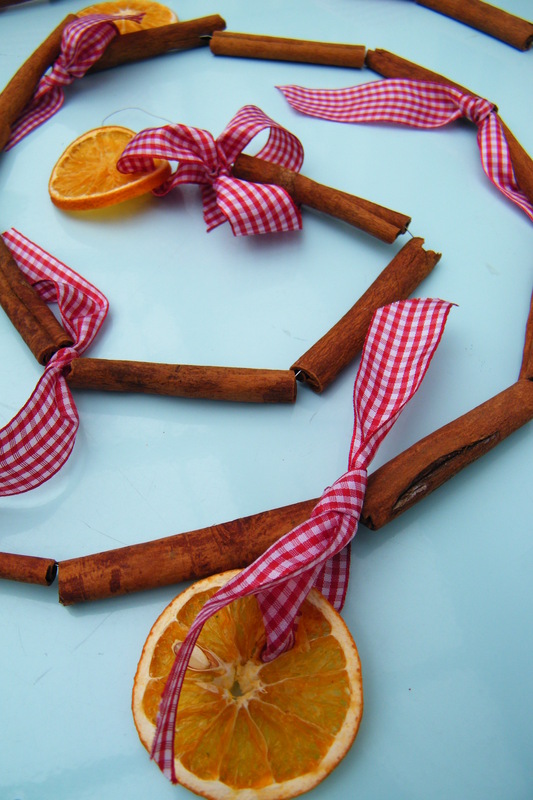 Following on from my recent post where I talked about how to make natural hanging decorations using cinnamon sticks and dried orange slices, here is a simple-to-make garland. 1. Cut the cinnamon sticks in half with a strong pair of kitchen scissors or secateurs. Shortened sticks make the garland look more fluid, and also the act of cutting the sticks releases some of their Christmassy fragrance. 2. Thread the cinnamon sticks onto the wire, and temporarily fold the wire over at each end to keep the sticks in place. 3. Count in three cinnamon sticks, then tie a 20cm piece of ribbon to the wire. Repeat every six cinnamon sticks so you end up with four ribbons tied on at regular intervals. 4. 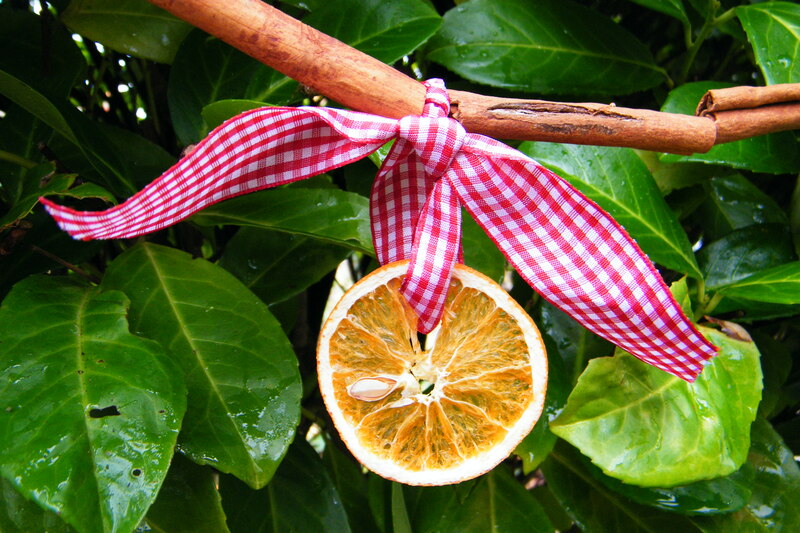 At each end, tie a 30cm piece of ribbon to the wire, and thread on an orange slice before tying again. Repeat every six cinnamon sticks, so you end up with five orange slices tied on at symmetrically alternating positions with the plain ribbons. 5. Make hanging loops at the two ends by turning the leftover wire back on itself and twisting together. Hide the end of the wire by poking back through the nearest cinnamon stick. Omit the orange slices or use them more frequently. Try threading the orange slices onto the wire with the cinnamon sticks, rather than hanging them separately. For a tiny tree, cut the cinnamon sticks into smaller pieces, or for a really big tree, don’t bother cutting them. If you would like to enhance the fragrance of the cinnamon sticks before use, you might find this recent blog post useful: How to make cinnamon fragranced bundles. Festive garlands can also be made by threading together dried chillies, whole dried oranges or rose hips.